Construction continues on The Well No. 45 Water Treatment Plant Addition project. 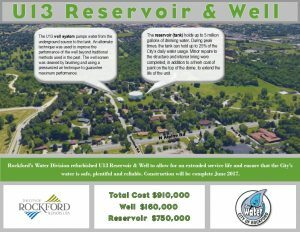 This project consists of abandoning three (3) wells originally constructed in the 1920s and constructing a radium treatment facility so that the well remaining, drilled in 2008, may be fully utilized. Pictured below are pictures of the filter vessel delivery. With the cold weather upon us the City of Rockford Water Division would like to remind you that the cold can wreak havoc on unprepared water pipes. Icy winds and falling temperatures can do a lot of damage to your home by freezing pipes and leaving you without flowing water. Before you have an emergency there are many precautions you can take now to help minimize later impacts. Open cupboard doors under sinks (especially where plumbing is on exterior walls) to let interior heat warm the pipes. Temporarily keep a steady drip of cold water at an inside faucet farthest from the meter. This keeps water moving, making it less likely to freeze. Never thaw a frozen pipe with an open flame. Use hot air from a hair dryer, the exhaust from a vacuum cleaner or a closely monitored heat lamp. If your pipes break, shut off the water at the shut-off valve and turn off the circuit breaker controlling the gas to the water heater. If there is no water at all to your home, the problem may be at the street. If the water service is frozen at the meter or the service to the water main, please contact call the City of Rockford Water Department at (779) 348-7300. Click here for more information on Cold Weather Preparedness. Please call (779) 348-7300 with any questions. remaining, drilled in 2008, may be fully utilized. Pictured below crews are pouring the bottom slab of the new backwash tank.